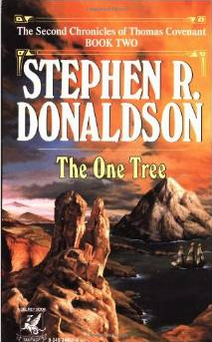 Not long after the completion of Thomas Covenant’s adventure in the first trilogy ( ‘Lord Foul’s Bane‘ in 1977, ‘The Illearth War‘ in 1978 and ‘The Power that Preserves‘ in 1979), Stephen Donaldson presented the second trilogy. First book of the ‘Second Chronicles of Thomas Covenant’’ was published in 1980 as “The Wounded Land“. It has been ten years since the last adventure of Thomas Covenant. He is still living at Haven Farm, in peace with its community and has acquired fame with the wonderful books he has written with the wisdom and knowledge he discovered in the Land. The book, however, opens with Linden Avery. She is a doctor, who has just moved to Covenant’s town, and her first assignment is a visit to Covenant’s house after a mysterious briefing by her colleague. Just outside the house, she meets an old beggar, who is dying. She saves him and he asks her to “Be True”. Inside the house, she meets Joan, Covenant’s ex-wife, who appears to be suffering from a mental illness. Covenant claims that she is possessed by Lord Foul. In the midst of a mystical ritual by Lord Foul’s followers, Covenant ends up willingly sacrificing his life to save Joan, and Linden jumps in to save him. Together, they wake up in the Land. It has been four thousand years in the Land, since Covenant’s last visit. And to Covenant, the people of the Land seem to have altered beyond recognition. Instead of the place enriched with health and beauty that he remembers, the new reality of life in Land is Sunbane. Sunbane is an evil phenomenon, where the Sun seems to be bringing illness and death in some form or other, with its rising every day. The only way that the people of the Land know, to endure the Sunbane, is by shedding human blood, thus Covenant and Linden’s lives are in mortal danger every minute they spend in the Land. They convince Sunder, a man from Mithil Stonedown, to guide them to Revelstone, the fortress of the Clave, the lore-masters who understand the Sunbane and control the Land. On the way, they are continuously pursued by Ravers, who inject a strange poison in Covenant. Covenant decides to visit Andelain once more, the epitome of beauty of the Land, which is now shunned. There he meets his dead friends, Saltheart Foamfollower, Bannor, Mhoram, Elena and Hile Troy. They give him strange gifts including a demondin-spawn called Vain. When Covenant comes out of Andelain, all his friends have disappeared. They have been taken hostage to Revelstone. He is once again confronted by a Raver, and nearly loses his life, but for the aid of the Waynhim. Finally, he arrives in Revelstone, to meet Gibbon, the Leader of the Clave. Desperate to save his friends’ lives and to understand Sunbane, he submits to a Soothtell. While bleeding to death in this evil ritual, he sees that Gibbon is controlled by a Raver, and thus the Clave actually serves Lord Foul, and that the main reason for the Land’s devastation, is that the Staff of Law, that supported the natural order, has been destroyed. He unleashes the wild magic, healing himself, and killing many of the Clave. He manages to flee Revelstone with his friends and the Haruchai, who have been prisoners of the Clave. His quest now has only one object: To find the One Tree, and re-make the Staff of Law. The Search, while trying to get away from the evils sent their way by the Clave, ends up in Sarangrave. In a life-threatening situation, they meet a party of giants. With the help of the creatures of underground, they finally find their way to Coerci, the ancient city of giants. There Covenant re-lives the horror of the last moments of all the giants that were killed in their homes by a giant Raver. In the Cammora of his wild magic, he offers solace to the dead giants and a hope to new giants. The Giants, promise to help him on his Search for the One Tree.